Wyoming court • If convicted of murder in the brutal slaying, Flint and Dereck Harrison may face the death penalty. 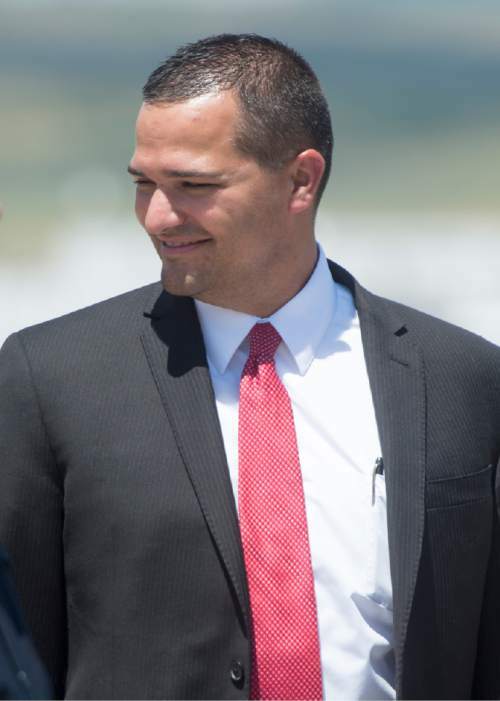 Rick Egan | The Salt Lake Tribune Spencer Allred, Lincoln County Attorney	visits with officers, after a press conference regarding the investigation into the homicide of Utah Transit Authority worker Kay Porter Ricks, at the Justice Center in, Kemmerer, Wyoming.Tuesday, June 28, 2016. 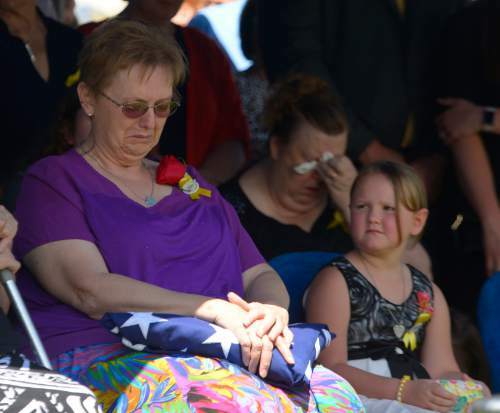 Leah Hogsten | The Salt Lake Tribune Oakley Ricks looks at her grandmother Lorie Ricks who sits at her husband's graveside, Utah Transit Authority electrician Kay Ricks, 63, who was laid to rest Saturday, May 28 at Lehi City Cemetery. Ricks served in the Navy and was a veteran of the Vietnam War, 4 years active duty and 2 years in the Naval Reserve and 8 years in the Utah National Guard. 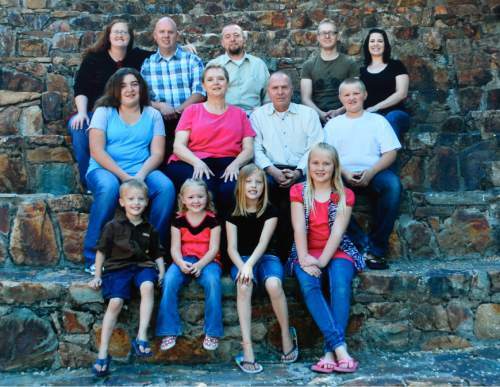 Utah police continue gathering evidence that could link two men who fled to Wyoming, after tying up and assaulting a mother and her four teenage daughters in a Centerville home on May 10, to the slaying of Ricks employee whose body was found in rural Wyoming. 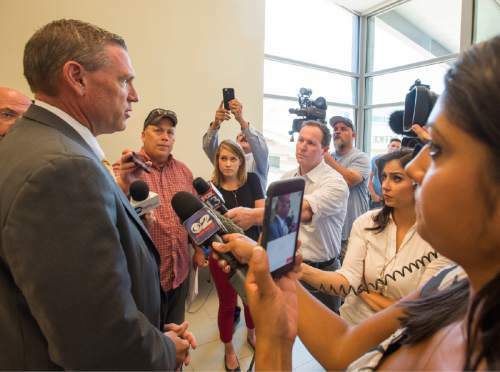 Rick Egan | The Salt Lake Tribune Richard Massey, spokesman for the Ricks family, answer questions from the press regarding the investigation into the homicide of Utah Transit Authority worker Kay Porter Ricks, at the Justice Center in, Kemmerer, Wyoming.Tuesday, June 28, 2016. 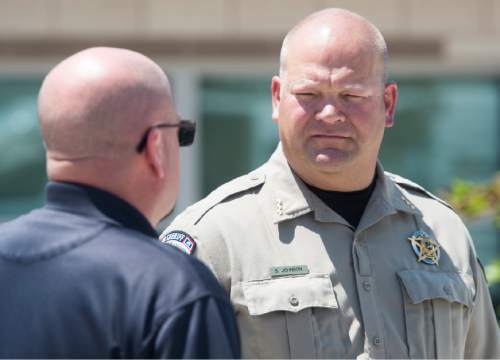 Rick Egan | The Salt Lake Tribune Lincoln County Sheriff Shane Johnson (right) visits with an officer after a press conference about the investigation into the homicide of Utah Transit Authority worker Kay Porter Ricks, at the Justice Center in, Kemmerer, Wyoming.Tuesday, June 28, 2016. 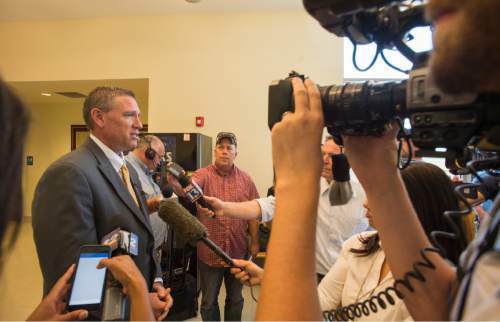 Rick Egan | The Salt Lake Tribune Richard Massey, spokesman for the Ricks family, answer questions from the press regarding the investigation into the homicide of Utah Transit Authority worker Kay Porter Ricks, at the Justice Center in, Kemmerer, Wyoming.Tuesday, June 28, 2016. 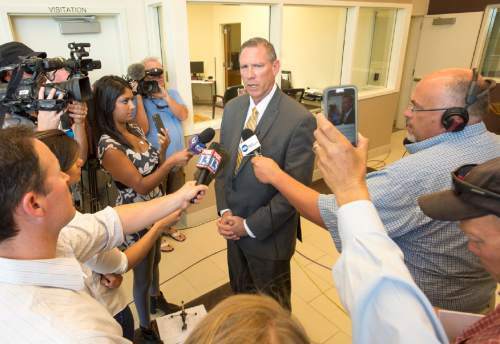 Rick Egan | The Salt Lake Tribune Richard Massey, spokesman for the Ricks family, answer questions from the press regarding the investigation into the homicide of Utah Transit Authority worker Kay Porter Ricks, at the Justice Center in, Kemmerer, Wyoming.Tuesday, June 28, 2016. 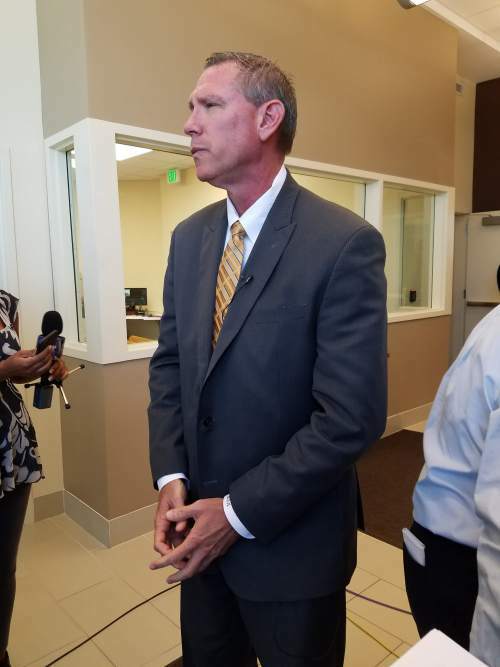 Rick Egan | The Salt Lake Tribune Richard Massey, spokesman for the Ricks family, answer questions from the press regarding the investigation into the homicide of Utah Transit Authority worker Kay Porter Ricks, at the Justice Center in, Kemmerer, Wyoming.Tuesday, June 28, 2016. 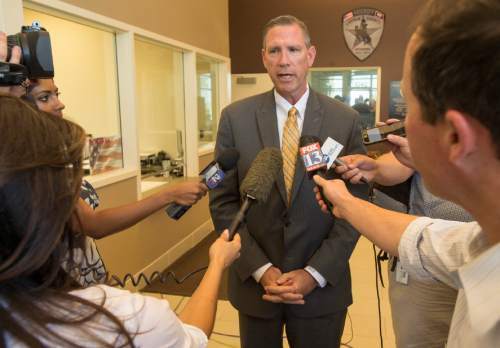 Rick Egan | The Salt Lake Tribune Richard Massey, spokesman for the Ricks family, answer questions from the press regarding the investigation into the homicide of Utah Transit Authority worker Kay Porter Ricks, at the Justice Center in, Kemmerer, Wyoming.Tuesday, June 28, 2016. Dereck Harrison Flint Harrison Jessica Miller | The Salt Lake Tribune Lincoln County, Wyo. 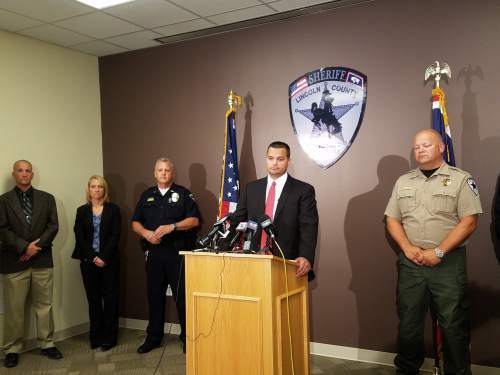 Attorney Spencer Allred addressing the media on June 28, 2016. 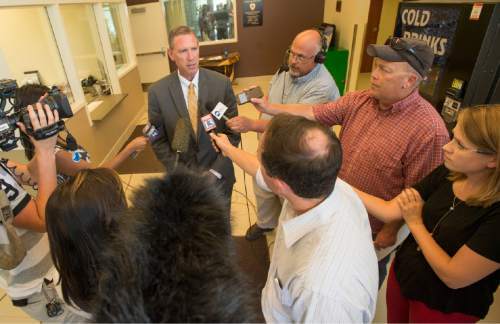 Rick Egan | The Salt Lake Tribune Richard Massey, spokesman for the Ricks family, gives a statement to the press regarding the investigation into the homicide of Utah Transit Authority worker Kay Porter Ricks, at the Justice Center in, Kemmerer, Wyoming.Tuesday, June 28, 2016. Francisco Kjolseth | The Salt Lake Tribune Richard Massey, a family spokesperson for missing UTA worker 63-year-old Kay Porter Ricks, holds up a family photograph of Kay, center right, with his family. Kay's body who was found Tuesday in Wyoming. Kay Ricks Jessica Miller | The Salt Lake Tribune Ricks family spokesperson Richard Massey just before addressing the media in Lincoln County, Wyo. on June 28, 2016. Kemmerer, Wyo. • A Utah father and son abducted Utah Transit Authority worker Kay Porter Ricks from a Salt Lake City TRAX platform last month, drove him to a remote location in Wyoming, beat him in the face and head, slashed his throat, dragged him behind sagebrush and left him to die, according to charges filed Tuesday. Afterward, Flint Wayne Harrison, 51, and Dereck James Harrison, 22, used fluorescent green spray paint to hide the UTA logo on Ricks&apos; work truck, then drove about 15 miles north to Diamondville, where they stopped at an Arctic Circle drive-thru before continuing north to Pinedale, charges state. 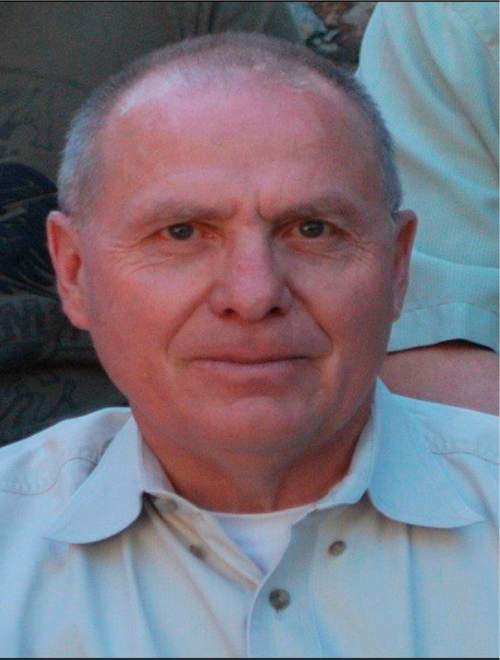 Police officers found the body of the 63-year-old American Fork man near a dirt road five days later, on May 17. "How can you not be shocked?" said Ricks family spokesman Richard Massey after reading the charging documents. "The sheer brutality is incomprehensible," said Massey, adding: "I&apos;m not looking forward to the meeting I&apos;m having tonight with the family." The Harrisons  who are in jail in Utah on unrelated charges  were each charged in Wyoming&apos;s 3rd District Circuit Court with four counts in connection with the abduction and slaying, and the theft of Ricks&apos; truck: murder in the first degree with premeditation and malice, murder in the first degree while perpetrating a kidnapping, kidnapping and wrongful taking or disposing of property. Lincoln County, Wyo., attorney Spencer Allred said at a Tuesday afternoon news conference that the murder charges carry the potential for the death penalty, but he declined to say whether he will seek it. Ricks died from "crushing wounds" to his face and head, according to charges, which describe the Harrisons repeatedly hitting the victim in the face and head with a blunt object, "which was swung with great accuracy and control." An object was found near the scene May 23, charging documents state, that matched the facial injuries; the documents do not detail what the item was. Allred also declined to further identify the object that facilitated the fatal blows. At some point, the Harrisons also sliced Ricks&apos; throat, charges allege, though the cutting wounds were mostly superficial. A blood-covered utility knife was under one of Ricks&apos; legs, according to charges. The Harrisons then dragged him behind a sagebrush and left him to die from blood loss and aspirating his blood, charges state. The UTA truck was found, and the Harrisons were arrested, near Pinedale in neighboring Sublette County a few days after Ricks&apos; body was found. 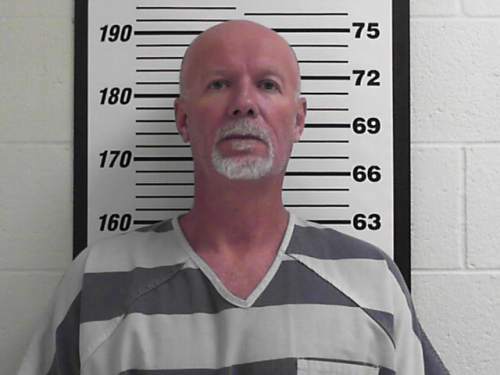 When the Harrisons allegedly abducted Ricks on May 12, they apparently were trying to elude a Utah manhunt that was sparked by their alleged short-lived abduction on May 10 of a Centerville woman and her four teenage daughters  who all quickly escaped despite being bound with zip ties. The motive for the Centerville abduction and assaults, police have said, appears to have been meth-fueled paranoia that the mother had informed police on their drug activities. 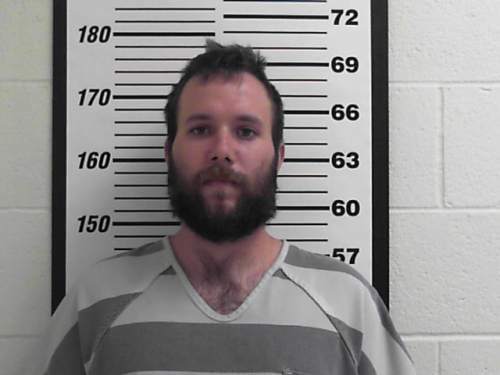 The Harrisons each have been charged in Utah&apos;s 2nd District Court with five counts of aggravated kidnapping, a first-degree felony, and five counts of aggravated assault, a third-degree felony, in connection with the Centerville episode. They remained in the Davis County jail Tuesday. No trial dates have been set, though Flint Harrison is expected to have a preliminary hearing next month. "Once felony procedures in Utah are completed, it is my intention to bring the Harrisons to Wyoming for trial," Allred said Tuesday. Massey, who traveled to Kemmerer for the news conference, said the Ricks family appreciates all the work police have done in investigating the homicide. The family is not hoping or searching for anything, he said, but they want those responsible to be in prison for the rest of their lives. "The family just doesn&apos;t want these two men outside of a jail cell again," Massey said in response to questions of a possible death-penalty outcome. 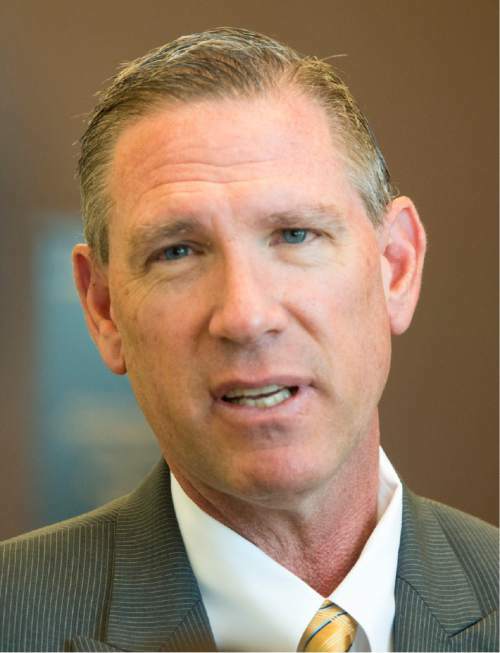 Massey also said the family doesn&apos;t want to watch or participate in any trial for the Harrisons, unless police and prosecutors believe their presence would be critical to the case. UTA police have said Ricks&apos; maintenance truck was last seen May 12 at 5:10 p.m. near the Ballpark TRAX station, at 1300 South and 200 West in Salt Lake City. The Harrisons, meanwhile, had been staying at a hotel 2 miles from where Ricks was working before his disappearance. According to the charging documents, a "commotion was transmitted" over Ricks&apos; radio before it was turned off about 5 p.m.
"The male sounded hurried and higher pitched as if someone was stressed," charges state. Charging documents do not detail how the Harrisons kidnapped Ricks, but investigators note that Ricks suffered an injury to his right temple "well-prior to his death." Police believe that after the kidnapping, the Harrisons drove along I-80 and crossed into Wyoming just before 6:30 p.m.
Less than an hour later, the Harrisons arrived in the Little Muddy Creek area, where police believe the Harrisons assaulted Ricks for 18 minutes before attempting to paint the truck and driving away. A store security camera in Diamondville, Wyo., photographed the UTA truck, according to charges, and two women who were in line behind the truck at the Diamondville Arctic Circle also spotted the truck. They eventually reported the sighting to police. The truck later was recovered near Half Moon Lake, near Pinedale.